There's something undoubtedly magical about Indian handicrafts. Unique, intricate, eye-catching and expressive, each item has a story behind it. It's impossible to come to India and return home empty-handed. Forget the ubiquitous handicraft emporiums and check out these interesting places to buy handicrafts in India instead! If you really love Indian handicrafts, you may also want to go on one (or more!) 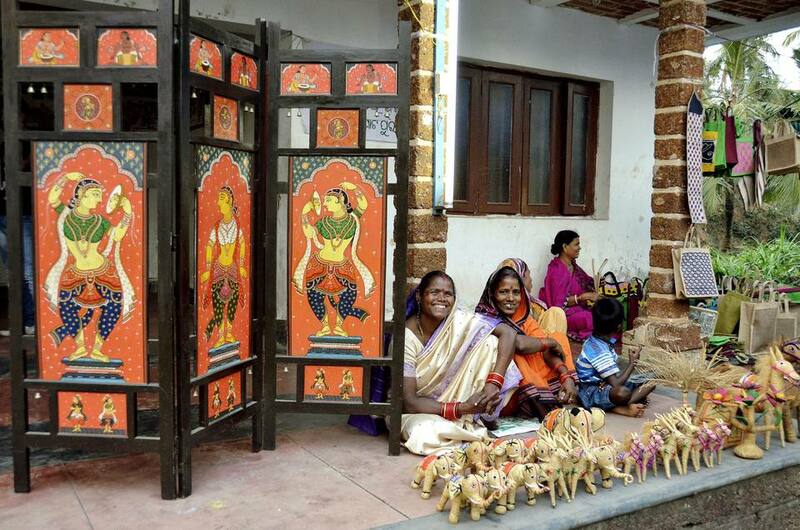 of these immersive Indian handicraft tours. And, don't miss visiting the huge annual Surajkund International Crafts Mela at Faridabad, if you're in the Delhi area in February! Shopping for handicrafts in Mumbai? Here are some recommended places there too. Skip Dilli Haat and head to Dastkar Nature Bazaar, near Qutub Minar and Mehrauli Archeological Park, for a wide variety of gorgeous handicrafts with a difference. (Unfortunately, an increasing number of stalls at Dilli Haat are being occupied by middlemen and traders rather than genuine artisans, and Chinese products are now being sold there). Dastkar is an NGO that works with traditional craftspeople across India to revive and promote their products. For 12 consecutive days every month (see calendar of events), the Nature Bazaar takes place with a new theme and artisans. There are also permanent handicraft and handloom stalls. It's open daily from 11 a.m. to 7 p.m., except Wednesdays. Do keep an eye out because events are held in other cities as well! MESH works with disabled artisans and people with leprosy, and they make beautiful high quality handicrafts. The items include bags, bed covers, cushion covers, hair accessories, home decor, toys, and cards. MESH has their own Design Studio where items are developed, so you can be assured of buying something unique. They also have a retail store in Uday Park, close to South Extension. It's open from 9.30 a.m. to 7 p.m., daily except Sundays. Can't make it there? You can now shop online. Colorful Sambhali Boutique is the perfect place to pick up some gorgeous Rajasthani handicrafts and clothing (both Indian and western style), all made by underprivileged women who are taught and employed by Sambhali Trust. The well-made items include silk and cotton camels and elephants, block-printed scarves and curtains, and shoulder bags. Custom orders can also be placed. The boutique is conveniently located near the clock tower in the city's central market area, and is one of the top places to visit in Jodhpur. Jaipur is famous for its distinctive blue pottery. The technique, which has Turko-Persian origins, was brought to India and used in mosques and palaces. It found its way to Jaipur in the 19th century during the reign of Maharaj Sawai Ram Singh II. He was so impressed with it, he decided it should be taught at his art school. Blue pottery received a much needed boost in the 1960s, when renowned artist Kripal Singh Shekhawat took an interest in it. His works can be found all over India, including in museums. Kripal Singh Shekhawat started Kripal Kumbh as an outlet for his wares, and the team has been trained by him. Both classical and modern pottery designs are sold there. You can even take a class to learn how to make it. The small showroom is situated in a private home in Jaipur's Bani Park. Other recommended places to buy blue pottery in Jaipur are Aurea Blue Pottery (a social enterprise that collaborates with local craftsmen) and Neeja International, particularly if you're interested in new designs. On the coast south of Chennai, Mahabalipuram (also called Mamallapuram) is a small surfing and temple town with a thriving backpacker scene. However, the town is most well-known for its UNESCO World Heritage listed monuments, which were carved out of stone by the Pallava dynasty in the 7th and 8th centuries. The exquisite rock-sculpting technique continues in the town today. Mahabalipuram was declared a World Stone Carving City by the UNESCO-affiliated World Crafts Council in 2015. In recognition of the art’s uniqueness to the region, the hand-crafted granite stone sculptures of Mahabalipuram were also granted a Geographical Indications (GI) tag in late 2017. You'll find stone workshops all over town and artisans will give you the best deals on statues. Also stop by Cholamandal Artists’ Village, between Mamallapuram and Chennai. Established in 1966, it's India's largest artists' community, where they live and sell their work. There are two villages to visit in Odisha where the residents are all artisans, engaged in their professions -- Raghurajpur Heritage Village and Pipli. At Raghurajpur, near Puri, the artisans carry out their crafts while sitting out the front of their prettily-painted houses. Many have even won national awards. Intricate Pattachitra art, with religious and tribal themes done over a piece of cloth, is a specialty. If you're passing through Bhubaneshwar, Ekamra Haat is also worth visiting. This permanent handicraft market, with around 50 shops, is located on a large plot at the Exhibition Ground. The Kutch region of Gujarat is renowned for its handicrafts, and Hiralaxmi Memorial Craft Park has been set up in Bhujodi village to provide artisans with a place to come and sell their wares on a rotational basis. You'll find diverse products there, including Mashroo weaving, leather work, embroidery, block printing, wood carving, pottery and metal work. If you're interested arts and crafts and would like to find out more about the work of local artisans, also don't miss visiting Khamir Craft Resource Center and Shop near Bhuj. The have a basic but comfortable guesthouse for those who wish to stay there. If you're interested in tribal art, one place you must visit is Must Art Gallery in Delhi's upmarket Panchsheel Park neighborhood. It's the world's first art gallery dedicated to tribal art from the Gond community, which is one of central India's largest indigenous communities. The works at Must Art Gallery consist of contemporary paintings and sculptures from the Pardhan Gond tribes, and many international artists are represented there. Also under the same roof is Gallerie AK, which specializes in all forms of traditional, contemporary, and modern Indian tribal and folk art. The galleries are open daily from 11 a.m. to 8 p.m.
Hatheli Sansthan, the artisans division of Barefoot College in Tilonia village, supports rural Rajasthani women to earn a living from making handicrafts. The products are sold under the Tilonia Bazaar label at their store in Patan, near Tilonia, about an hour before Ajmer on the Jaipur-Ajmer Highway. What really makes them stand out is the blend of traditional and contemporary designs -- so, there's really something for everyone! The products range from beautiful textiles to painted wooden letters of the Hindi alphabet that are great for learning. The shop is open daily from 9 a.m. to 8 p.m.
About an hour and a half from Bangalore, on the Bangalore-Mysore Highway, Channapatna is affectionately referred to as "toy town" because of the lacquered wooden toys that are made there. The craft's origin can be traced back the time Tipu Sultan ruled Mysore in the 18th century. He invited artisans from Persia to come and teach it to local artisans. Most of the residents of Channapatna now are involved in making toys, which include brightly painted wooden rocking horses. Many work at the Kala Nagar artisans colony set up by the Indian government. There's also a cluster of home workshops nearby. In addition, Maya Organic is an NGO that helps artisans with product design and skill development (they have a retail outlet in Bangalore). Groundbreaking Devrai Art Village, about five hours from Mumbai, is patenting its own version of Chhattisgarh's dhokra art. The village was established in 2008 to provide tribal artists from Naxal-affected regions of Chhattisgarh and Gadchiroli in Maharashtra with a place to carry out their craft. It was founded, in part, by an award-winning tribal artist from Gadchiroli with a passion for community development. The village now has about 35 resident tribal artists. They're encouraged to experiment with new designs and seek inspiration from communing with nature. Different mediums are used, such as stone, wood, bamboo and brass. The village has a workshop and gallery, open all year, where visitors can get an understanding of the dhokra process and purchase products. "Deshaj", meaning indigenous, is the artisan-led fashion and lifestyle brand of AIM Art Illuminates Mankind (a social welfare organization for artisans of India). While the organization was founded by a husband and wife duo in 2003, the brand was later formed in 2015 and the store opened in 2017. Deshaj promotes innovative yet budget-friendly handicrafts, made by the Bengal artisans that AIM has nurtured and trained. They're from poor and underprivileged backgrounds, and the brand gives them hope that their work is appreciated and they'll be able to earn an ongoing livelihood. The brand's main design center is near the cultural town of Shantiniketan, which was made famous by Nobel Laureate Rabindranath Tagore. 45 villages in and around the area are involved in the production of the handicrafts. The store also has a cozy cafe that serves 24 varieties of tea and snacks. It's housed in a quaint bungalow on Old Ballygunge First Lane, and is open daily from 10 a.m. to 10 p.m.